VIRTUAL EXERCISE: WHAT DOES IT REALLY MEAN? Technology is changing at a rate of knots, and so are the terms we use to explain it. These days the term virtual can mean, well, virtually anything. So what exactly is virtual exercise? For most of us, words like virtual, almost and nearly are interchangeable. So if you almost make it off the couch and nearly do a workout, have you done a virtual workout? Sadly not. Virtual fitness is the fusion of exercise with technology. But if this conjures images of awkwardly powering through sets of star jumps wearing a virtual reality headset – fear not. Virtual workouts are the same workouts you already know and love, or perhaps want to try, designed for ease and convenience to suit your own schedule and needs. Typically, virtual workouts are played in gyms on the big screen – some clubs have them prescheduled and some facilities enable you to play the workout whenever you fancy. It’s the round-the-clock accessibility that makes them a hit with everyone from shift workers to moms, and anyone else who’s not keen or able to battle rush hour at the gym. Virtual classes are often a gateway for live group fitness classes. 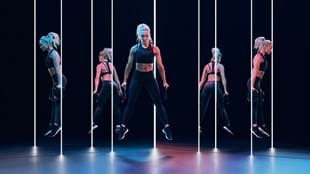 So, if the thought of joining a throng of confident, seasoned group exercisers in a packed fitness studio daunts you, virtual could be the way to go. Virtual workouts typically attract smaller numbers, and you can go at your own pace, which makes them ideal if you’re a novice looking to learn the moves. Not all virtual workouts are created equally. The best are based on proven exercise science. Choose a LES MILLS™ Virtual workout and you’ll be doing the same workouts that are loved by millions worldwide. These workouts are developed by fitness professionals, they feature moves developed by exercise scientists and subjected to a rigorous testing and development process. What’s more, they are led by highly-skilled presenters who have been hand-picked from all over the globe. Research shows the camaraderie of group fitness can be very beneficial, and there are also findings indicating that technology-based “virtual” group fitness can be advantageous too. A University of Michigan study looking at group fitness video games found that those who worked out virtually had increased motivation and performed better than when they were alone. It all came down to the fact they were alongside “superior” players. This suggests that when people work out virtually, the fact that they are exercising alongside leading fitness professionals on-screen may help them raise the bar and improve performance. There’s also proof that the sensory experience created by modern technology can help. A recent study of immersive cycling class THE TRIP™ showed the audio-visual components encourage participants to work out at harder than they perceive with less discomfort. You can now enjoy the benefits of LES MILLS Virtual workouts in fitness facilities around the globe. Find out more here. You can also work out with Les Mills on the small screen with LES MILLS™ On Demand.